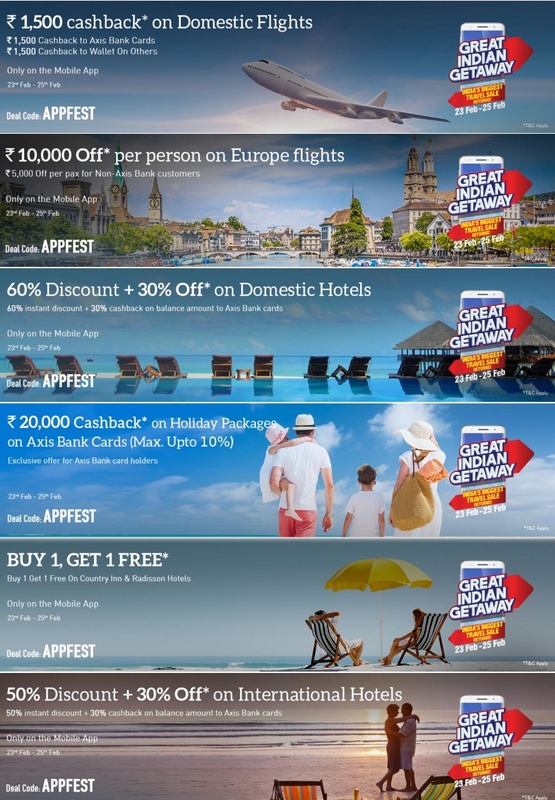 Makemytrip is Great Indian Getaway Where they Are start Makemytrip Indias Biggest Travel Sale Ever where you can Get Rs 1500 off on Hotels On Flights,Hotels &Holidays Trip Only On The MakeMyTrip Mobile App. Download Makemytrip mobile app to avail offers. Offer is valid on all bookings (one way or return) with a minimum booking value of Rs.6,000. One booking under the cashback to card offer. One booking under the cashback to my wallet offer. All other users are eligible for one booking only under the my wallet offer. For INR 1500 cashback to card offer,please make payment using Axis Bank Debit or Credit card only. For INR 1500 cashback to My Wallet,payment can be made using any other non-Axis Bank card or net banking services. Watch out for the APPYHOURS every Thursday &Secret Deals/Special Rates on Hotels.